TOPIC | Constellation Gene, Turkeys, and Gems! [center][permalink][img]http://flightrising.com/dropbox/banner_geneconstellation_shiningshimmeringsplendind.png[/img][/permalink][/center] The otherworldly energies of the heavens beckon once again. Cosmic patterns are now starting to manifest on dragon wings and crests. Starmap's complimentary secondary gene, [b]Constellation[/b], is now available in the [b]Gem Marketplace[/b]! That's not all, however: attracted to the glittering star-like patterns, bold [b]Woodland Turkeys[/b] are beginning to poke their heads out from the snow-covered undergrowth of the [b]Boreal Wood[/b]. In addition to these updates, we're also running a [b]gem promotion[/b]: All gem packages purchased will yield a [b]bonus 10%[/b] gems, so now is the perfect time to stock up! [center][permalink][b]Click here to learn more about this update. [/b][/permalink][/center] [more] ---------- [size=5][b]New Secondary Gene: Constellation[/b][/size] Today we've launched our newest secondary gene: [b]Constellation[/b]. This twinkling gene applies a swirling galactic depiction of a dragon-shaped star pattern across the wings and crests. Constellation is the complimentary gene to [b]Starmap[/b], a primary gene we released [b][url=http://www1.flightrising.com/forums/ann/2500728]last August[/url][/b]. The two pair quite nicely! 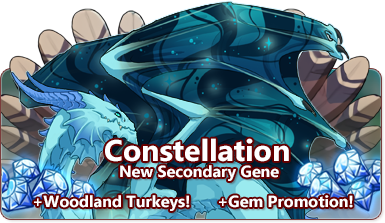 Constellation is available now in the [url=http://flightrising.com/main.php?p=market&tab=spec&type=1][b]Gem Marketplace[/b][/url]. 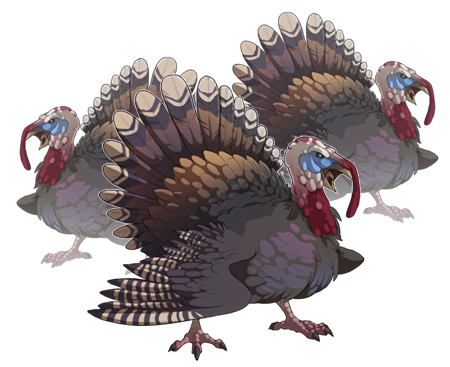 [center][item=Secondary Gene: Constellation][/center] [center][img]http://flightrising.com/dropbox/preview_starwings.png[/img][/center] [size=5][b]Woodland Turkeys[/b][/size] The confident and colorful Woodland Turkeys are once again appearing in the Boreal Wood for a limited time. From now until [b]Monday, November 26 @ 06:00[/b], you'll be able to encounter these fighting fowl for a chance at some exclusively-seasoned loot: [center][img]http://flightrising.com/dropbox/therealterrorbird.png[/img][/center] [center][item=Turkey Dinner][item=Woodland Turkey][/center] [size=5][b]Promotion: 10% Gems Bonus[/b][/size] Are you looking to grab some gems for a friend or loved one as part of the holiday season? Or perhaps you're just lookin' to stock up for yourself and save for a special project later on? Now's a great time! From now until [b]Monday, November 26 @ 06:00[/b], [url=http://flightrising.com/main.php?p=ge][b]any gem package you purchase[/b][/url] will contain [b]an additional 10% gems[/b] at no extra charge! The otherworldly energies of the heavens beckon once again. Cosmic patterns are now starting to manifest on dragon wings and crests. Starmap's complimentary secondary gene, Constellation, is now available in the Gem Marketplace! That's not all, however: attracted to the glittering star-like patterns, bold Woodland Turkeys are beginning to poke their heads out from the snow-covered undergrowth of the Boreal Wood. In addition to these updates, we're also running a gem promotion: All gem packages purchased will yield a bonus 10% gems, so now is the perfect time to stock up! Today we've launched our newest secondary gene: Constellation. This twinkling gene applies a swirling galactic depiction of a dragon-shaped star pattern across the wings and crests. Constellation is the complimentary gene to Starmap, a primary gene we released last August. The two pair quite nicely! Constellation is available now in the Gem Marketplace. Are you looking to grab some gems for a friend or loved one as part of the holiday season? Or perhaps you're just lookin' to stock up for yourself and save for a special project later on? Now's a great time! From now until Monday, November 26 @ 06:00, any gem package you purchase will contain an additional 10% gems at no extra charge! YESSS! It's so beautiful. And yay, turkey time!